Live in the Cleveland, Hudson., Ohio area? Tuesday, September 17 at 7 p.m.
Do you have a story to tell or an idea to convey and don’t quite know how to deliver it to your audience? Would you like to connect with other writers and receive some mentoring from seasoned authors? Come to the Hudson Library & Historical Society on Tuesday, September 17, at 7:00 p.m. for the inaugural session of the library’s own Writers’ Group. 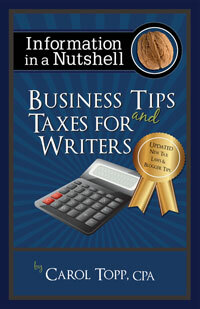 Carol Topp is the author of Information in a Nutshell: Business Tips and Taxes for Writers, the three-volume Micro Business for Teens series and Homeschool Co-ops: How to Start Them, Run Them and Not Burn Out, as well as numerous magazine articles. Topp will explain the process to become a published author, which she claims is “easier than ever “now. Register for this free workshop online or call 330.653.6658 x1010.